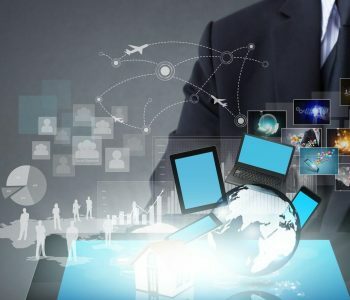 Business intelligence (BI) platforms enable organizations to collect data from internal systems and external sources, and present it for analysis. 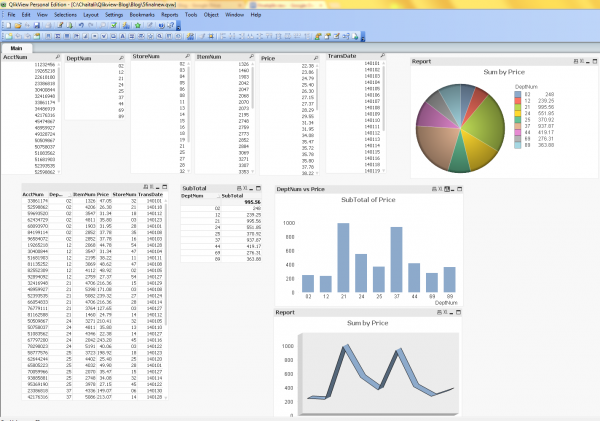 QlikView is a popular BI tool that bundles an in-memory back-end analytic engine with an intuitive user interface. 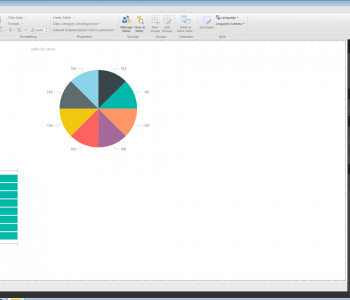 Its users can integrate data and visualize the results in the same tool. 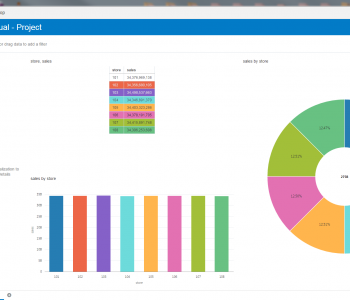 With demos, training manuals, and tutorials, most users can produce reports before long, though some complain about the menus being less than intuitive. 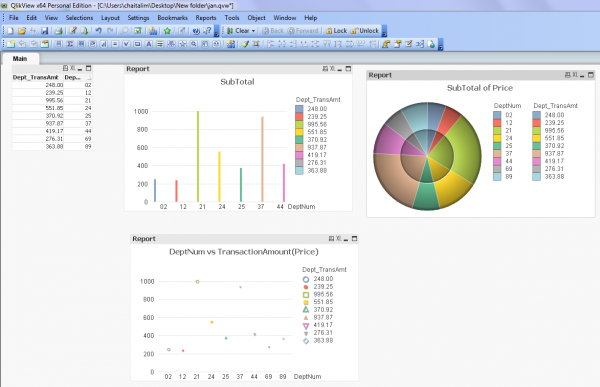 However, QlikView cannot directly address many legacy or dark data sources, nor the multi-billion- row files or database tables common to high-volume transaction environments. 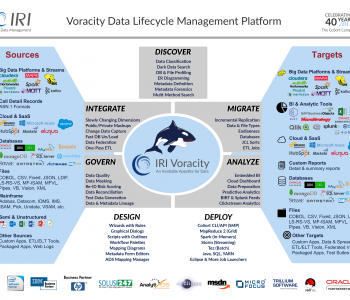 Thus, it is in big data acquisition and preparation (data integration) that IRI CoSort provides value to QlikView users. 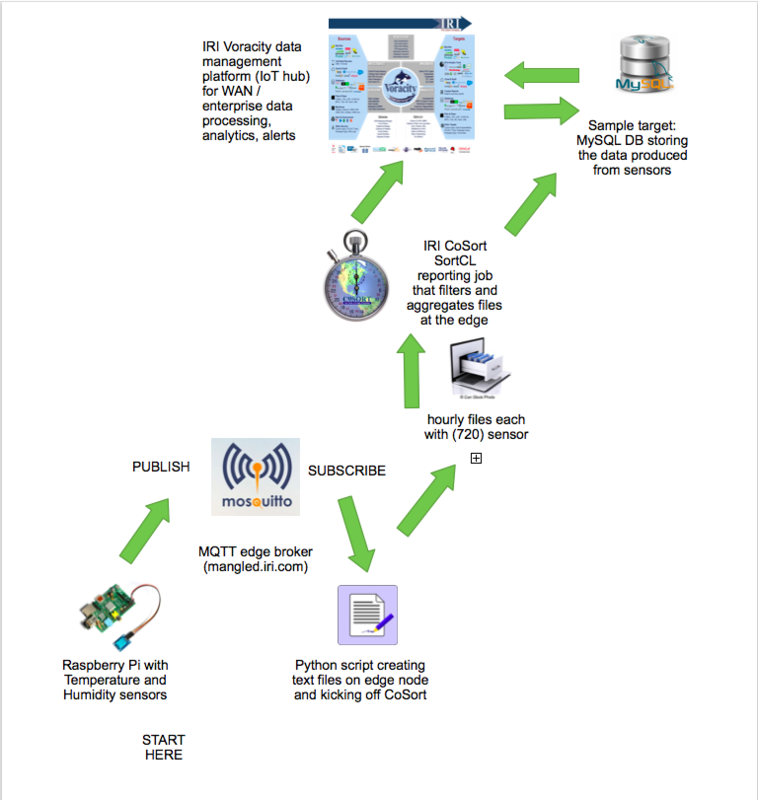 CoSort can extract and join data from multiple sources and provide it to various targets. Without a DB engine, appliance, or Hadoop, CoSort can franchise (munge, subset, wrangle) or otherwise prepare massive amounts of raw data for downstream applications. 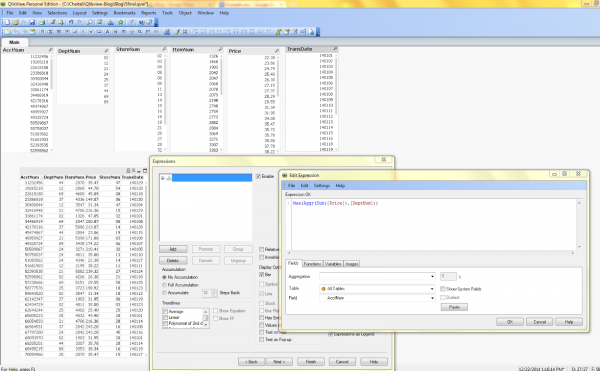 To demonstrate the relative performance of preparing data for QlikView visualizations using both QlikView and CoSort/SortCL, I acquired and processed large CSV files with both systems, and timed their differences. 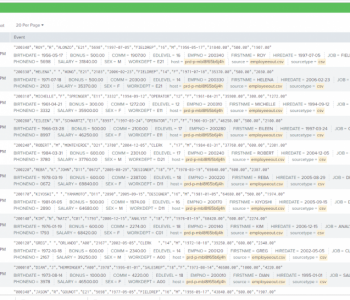 On my 8GB PC, QlikView failed at 150M rows (CoSort did not). The data that both systems made available for QlikView charts was the same, but the time they took to prepare it was anything but. Given 20 million rows of source data, the CoSort SortCL program — tuned to use only half my available RAM (4 of 8GB) — took 25 seconds to produce the charted values, while QlikView required 303 seconds. CoSort was considerably faster than QlikView whether testing with small or large amounts of data.The chart below shows the sort and aggregation throughput for files with 20 million records (885MB), 50 million records (2.122GB), 100 million records (4.424GB), 130 million records (5.752GB) , and 150 million records (6.637GB). In each case CoSort’s SortCL program performed better than QlikView. 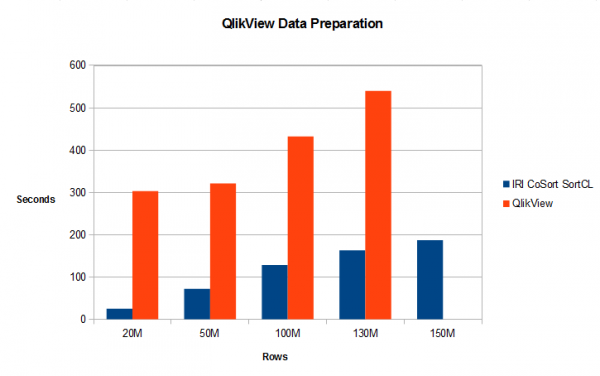 At 150 million records, QlikView got an insufficient memory error and could not run the job, while SortCL ran it in 187 seconds — again with only half the available memory aboard — almost twice as fast as QlikView was at 20M records. 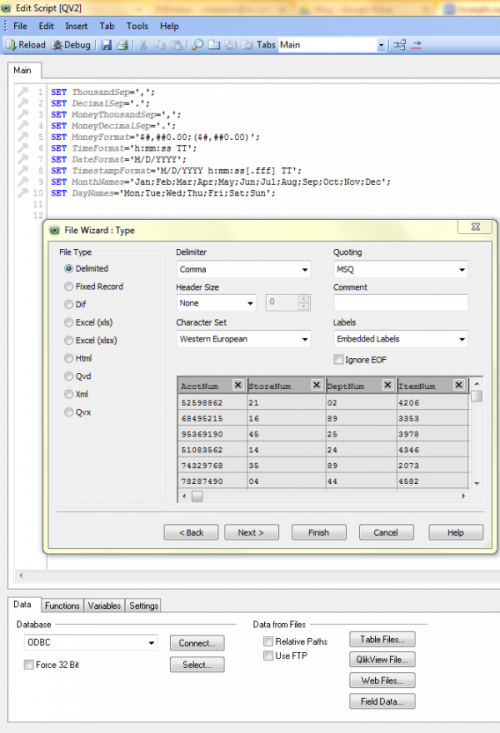 Click Next, and select the option to insert an aggregation formula. Specifying the expression: Max(Aggr(Sum([Price]),[DeptNum])) calculates the total sales volume (via the Price column) for all the items in each DeptNum. 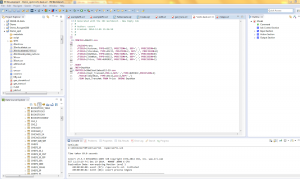 To sort and sum the same data in CoSort, I need a simple SortCL job script. I can either write it by hand, or use the new sort job wizard in the free IRI Workbench GUI. 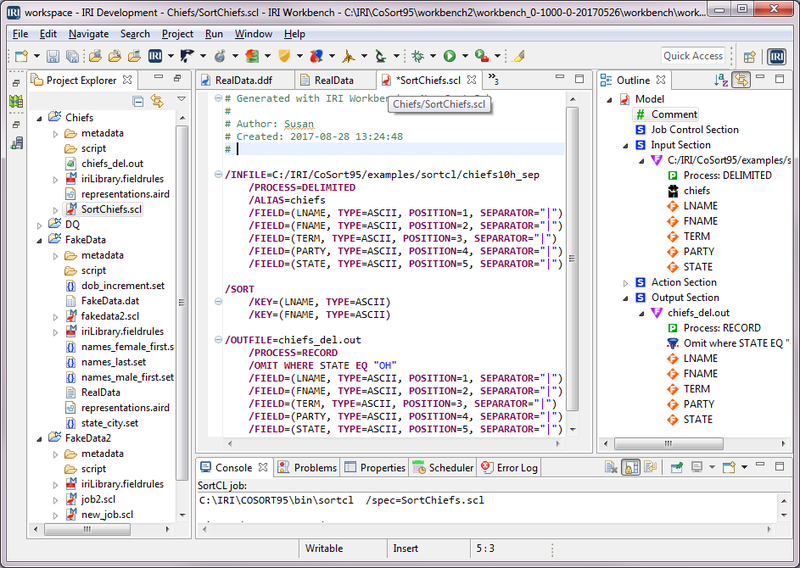 IRI Workbench is an integrated development environment (IDE) built on Eclipse™ to create, run, and manage data connections, metadata, and job scripts. Learning the language is simple enough, and I can write and modify the scripts in the GUI’s syntax-aware editor. But for those finding any 4GL scripting objectionable, the GUI can also build them automatically with an end-to-end job wizard or a visual ETL workflow (palette). 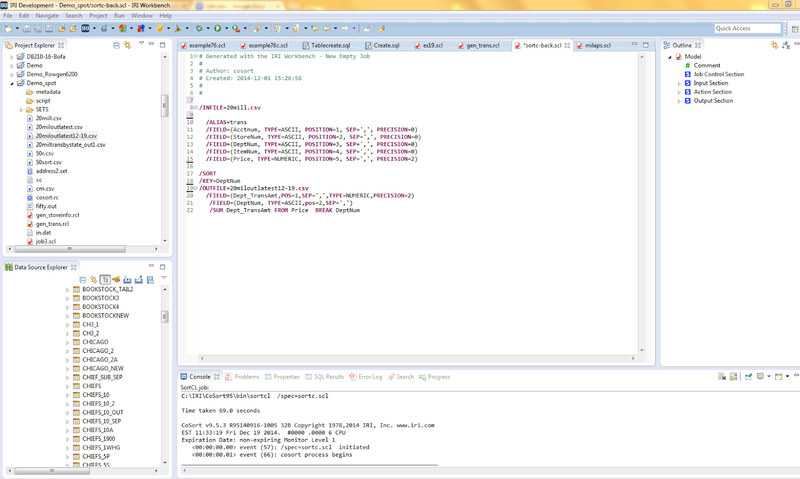 IRI Workbench view. Click to see the CoSort/SortCL job script that prepared the data. In addition to being easier to learn and use than the 11 QlikView steps above, I have saved metadata and job templates that I can re-use, extend, and share, plus centrally-accessible data results for use in multiple visualization and applications. Select a chart type and click Next. Select First Dimension (DeptNum) and Second Dimension (Price) and click Next. In the Define Expression dialog, bypass the options and click Finish. 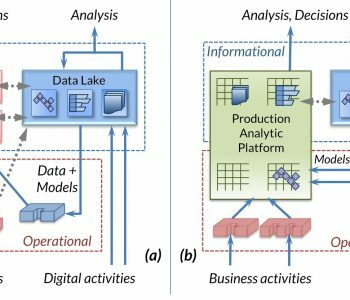 See this section of the web site for more information on data preparation for BI (tool acceleration). 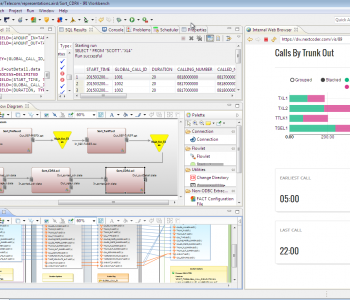 If you need help implementing CoSort in QlikView environments, contact IRI support.